This page is an archive of project news. Events that were organised by the Project are listed on the Events page. Although the Association of American University Presses has held an annual conference for several decades, this will be the first event to focus on the university press in a UK context. There are at present more than twenty university presses in the UK, for whom this event will be an essential forum to benchmark existing practices and map out possible future developments. The two-day conference will also provide a useful primer for the increasing number of UK universities that are considering the launch of their own imprints through library repositories, corporate communications departments or as discrete entities. The UK offices of American presses, university presses in mainland Europe, and publishing studies scholars will also find this an important forum for the discussion of the university press. Hosted by Liverpool University Press, The IPG Frankfurt Book Fair Academic and Professional Publisher of the Year 2015, and The Bookseller Independent Academic, Educational and Professional Publisher of the Year 2015, as part of The Academic Book of the Future project. This two day conference discusses how profound changes in publishing will affect the Academic Book of the Future in the South. Organised by The British Library in collaboration with Professor Marilyn Deegan, Kings College London and Dr Caroline Davis, Oxford Brookes University. The Project will be working with UCL Press on a new publication in 2016 – a BOOC (Book as Open Online Content) – title to be finalised. Further updates will be posted here as more is announced. 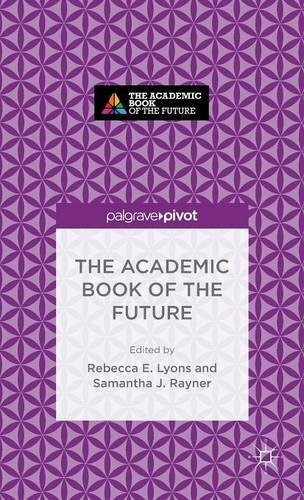 13 Nov 2015: The first Project publication is launched – The Academic Book of the Future, a Palgrave Pivot! The project teamed up with Palgrave Macmillan and 13 expert contributors across academia, publishing, libraries, and bookselling to produce this Open Access publication tackling some of the major issues and questions around academic books in current and emerging contexts. The book has been reviewed on the LSE Review of Books. Nov 2015: The inaugural #AcBookWeek is a huge success! Nearly 80 events and activities took place all over the UK as well as internationally during the inaugural #AcBookWeek (9-16 November 2015), including seminars, workshops, debates, symposia, exhibitions (both physical and virtual), writing sprints, competitions, promotions, offers, and others. All the events were organised by our coalition communities across libraries, publishing, academia, bookselling, as well as some in collaboration with other associated communities, including Frequency Festival, TCCE’s Inside Out Festival, and NEoN Digital Arts Festival. To open up opportunities for conversation and collaboration between publishers (via the PA, the ALPSP), booksellers (via the BA), librarians (via RLUK and CILIP) and researchers (via the AHRC, British Academy, Jisc, Hefce, and the Wellcome Trust). The week was a resounding success in achieving these aims, especially in terms of community engagement and collaboration, impact, publicity, and most crucially the exploration and discussion of our key project research questions, and the indication of other key areas of concern and interest for our associated communities. 78 events and activities in 21 locations across the UK, as well as in Mexico and the USA . Visitors from 113 countries to the two Project websites during 9-15 November 2015. Manchester University Press announces the launch of Lund University Press, a new Open Access imprint that will publish peer-reviewed books in the Humanities and Religious Studies. The imprint will focus on monographs, with some collections of essays. The works published will in some cases be brand-new titles, and in others will make world-class research previously published only in Swedish available to an international audience in English. Each book published will be free to access online via the OAPEN platform, with print editions available for purchase. Lund University Press aims to publish between two and three books a year initially, building up to ten books a year over time. Manchester University Press will provide publishing and distribution services for the Lund UP titles, including North American distribution via Oxford University Press. The project will begin in late 2015 with the aim of making works available beginning in early 2017. PI Dr Sam Rayner and Simon Tanner attended on 21 July. The Project was invited to attend this Large Grants Meeting in Oxford. PI Dr Sam Rayner and Simon Tanner went on behalf of the Project. PI Dr Sam Rayner met with Sarah Barrow (Lincoln), Elaine Treharne (Stanford), and Caroline Palmer (Boydell & Brewer) to discuss further involvement in the Project. Watch this space! PM Rebecca Lyons met with Chris Hassan and Valerie Brown at the Wellcome Trust, and started conversations around #AcBookFuture events in their newly refurbished Reading Rooms. 12 June 2015: Project awarded more funds! The Project has been awarded further funds from the AHRC to assist with costs for Academic Book Week. This is wonderful news, and will undoubtedly help to make the week a huge success! PI Dr Sam Rayner attended an AHRC Digital Transformations day, and an AHRC Commons Workshop. PI Dr Sam Rayner took part in a HEFCE workshop on OA Monographs. Rebecca and Sam met with Palgrave Macmillan to discuss an exciting collaboration between the Project and their innovative Pivot short-form monograph series. Sam and Rebecca held meetings at Bangor University on several Project strands: The Academic Bookshop of the future (with Eben Muse and John Smiths bookshops); Welsh medium research, and Arthurian special collections with the Library and Raluca Radulescu. Marilyn Deegan (KCL) and Guyda Armstrong (Manchester) speak about the Project at Brown University, Rhode Island. Maja Maricevic, Head of Higher Education at the British Library invited Rebecca Lyons to give an introductory overview to the Project to interested members of staff during a lunchtime event. Rebecca invited comment on and participation in the Project, and the talk sparked several interesting debates and new avenues of inquiry. Project team member Simon Tanner attended this HEFCE event reflecting on the most recent REF exercise. The Project’s findings may help to inform REF 2026, so this was a very useful day. See the event page here, including presentations from the speakers, and a link to the Impact Case Studies database. In this seminar Project Team member Simon Tanner asked the question “what do scholars want from the academic book?” He explained the Project’s research plans for the coming year, highlighting some of the key issues and inviting comments and engagement from the floor as part of that planning. PI Dr Sam Rayner and PM Rebecca Lyons took part in this dynamic one-day event, bringing together web developers and arts and humanities scholars to celebrate the release of over 25,000 texts from the Early English Books Online project into the public domain. Find out more about the event here. Project Manager Rebecca Lyons attended Digital Conversations at the BL on the 19 Feb – one of a series of quarterly events on digital topics. This one, organised by curator in digital research James Baker, was called ‘A Web of Rights’, and involved three panellists and a chair discussing internet rights, privacy, open access, and related topics. Bex is now organising an #AcBookFuture Digital Conversations event to take place at the BL on the 24 Sept 2015. Watch this space for more news on that event! Project Team member Prof. Deegan was invited to give a paper on the project at Alzaim Alzazhari University in Khartoum North, organized by the Sudanese Library Association. See her blog post about it here.